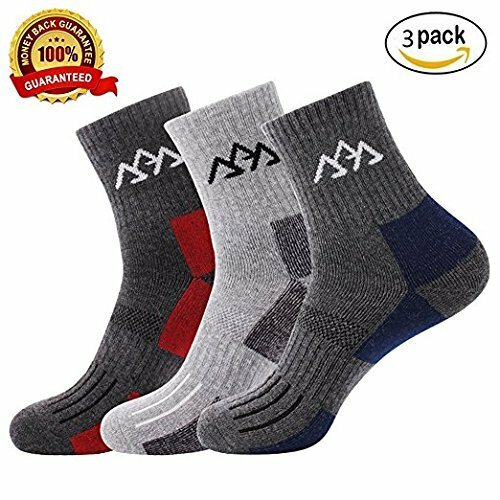 This 3 pack men's cushion hiking socks set featuring full thickness and fine gauge knitting technology brings you both of them with reasonable price in a classical style pattern design! - Material: Made of 50% Cotton, 45% nylon, 5% spandexElasticity. - Size: L (Men < 10 US Size). - Weight: 0.12lb/57g per pair. 【BLENDED FOR STRENGTH & DURABLILITY】Made of 50% Cotton, 45% nylon, 5% spandexElasticity. Socks are designed to keep your feet warm and dry during the rigors of trekking the earth's wild place. They are Strong and durable socks. 【SIMPLE TO CARE FOR】Because the outdoor socks are of such high quality, you can launder them in the washing machine. That means you never have to hand wash these socks. 【SUPERIOR VALUE】The socks are moisture wicking,quick-drying,anti-bacterial,ventilation,deodorant and smell free.They could keep your feet dry,warm and comfortable during hiking,trekking,long walks. You just need a nice pair of everyday socks. If you have any questions about this product by Victoryun, contact us by completing and submitting the form below. If you are looking for a specif part number, please include it with your message.